We have been organizing events to fundraise for victims of East Japan Disasters that occurred on 11 March 2011. This year, it will be held in Lecce, Italy, on 31 May – 1 June. 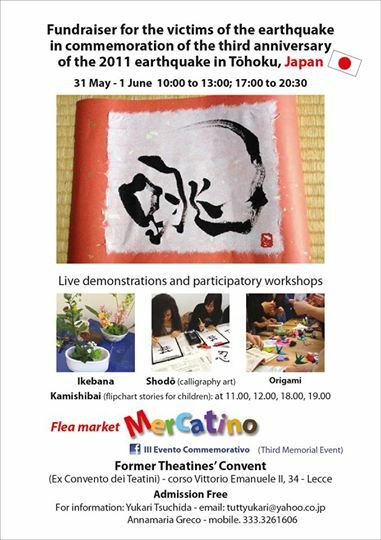 Goods from Japanese artists and beautiful Japanese art crafts are on sale to fundraise. All the profit will be donated to the NPO working in Fukushima on children’s education: BEANS FUKUSHIMA. All welcome, and spread words!